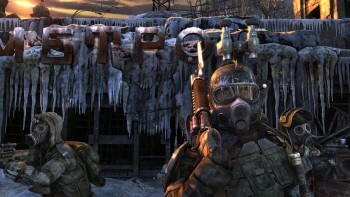 Metro 2034 Will "Compete With Call of Duty"
THQ's Danny Bilson says the sequel to Metro 2033 will be a more polished affair that will "compete with the Call of Dutys" but still be a distinctly Russian videogame. The general consensus about Metro 2033, the 2010 shooter from 4A Games, was fairly typical for Russian (actually Ukrainian) games: brilliantly atmospheric but plagued by stumbling gameplay. But that won't be the case with Metro 2034, according to Bilson, who told IGN that the sequel is getting a whole lot more love than the original. "The sequel's going to get a lot more support than the first one got both from product development at THQ and marketing," he said. "There were certain things in [Metro 2033], even though it looked sensational, some of the shooting mechanics need to be better polished to compete with the Call of Dutys. They are this time. For marketing it'll get a much more respectful push." One thing fans of Russian (actually Ukrainian) games don't want to see, however, is an overt Westernization of their franchises. Games like S.T.A.L.K.E.R., Cryostasis and of course Metro 2033 have their own unique flavor which emerges in large part from their bizarre plots and viciously unforgiving nature. Russian (actually Ukrainian) games really are different from their Western counterparts and Bilson said that's one thing THQ has no intention of changing. "I'm a big supporter of that team in Kiev. It's an original Russian franchise. We don't want to mess with it and Americanize it," he continued. "It's got its own point of view. Even though our guys in Agoura [Hills, THQ's headquarters] did a lot of the work on the fiction, this time it's still that vision. You're going to see a more polished game, you're going to see some crazy technology. We green-lit it before the other one shipped and you're going to see some of it at E3." THQ said in June 2010 that a 3D version of Metro 2034 is in the works, although there's not yet been any word on platforms or release date.